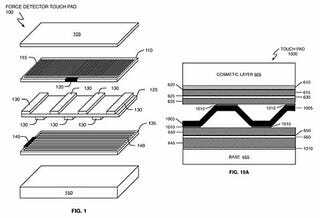 Aiming to go beyond just sensing the location of your finger on its touchpads and touchscreens, Apple has applied for a patent for a "Force Imaging Input and Device System," which amounts to a spring-like device underneath the touchscreen or touchpad. The pressure-sensitive "force detector" layer would create a separate set of data, or image, that could add another dimension to interacting with Apple's phones, media players, laptops and displays. After the jump, see a full-sized diagram of the idea.